I got this plant at a Home Depot in North Carolina. It has broad, flat, somewhat ruffled & curled, light dusty green leaves encircling the base, and 3 long, thin stems with small leaves growing from the center. These stems have unfurled over time and flowered with small pink flowers, which shrivel but do not fall off. The first picture is from when I first got it, a few months ago, and the rest are from today. As of today it is a little over a foot tall. It lives in my cubicle at work. I give it a little water once a week, and I put it in the window over the weekends to soak up some sun. It seems to be pretty happy thus far. 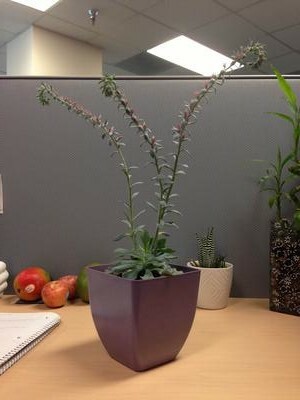 I would love to know what this plant is so I can take better care of it and know what to expect as it continues to grow. Thank you so much for providing this service! 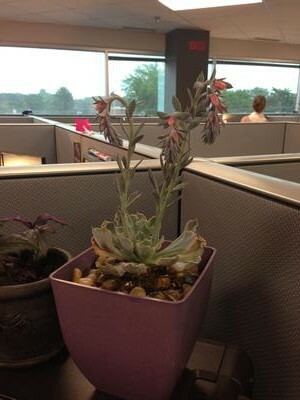 Hi Becky, this is one of the many gorgeous Echeveria. 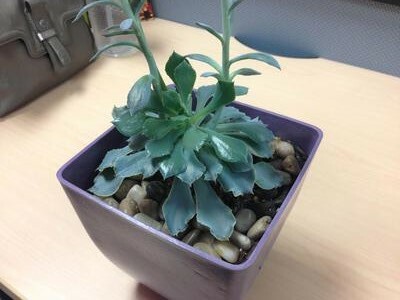 I'm not sure of the exact kind, but judging from the thin leaves with the ruffly edge I'm going to go out on a limb and say that it's probably a hybrid of Echeveria shaviana. These are relatively easy to grow, provided you understand where they originate; in a warm bright climate. The air and the soil in their native habitat are dry, and they need to be kept at room temperatures that dip a little at night. My only concern for this plant is that it might not get enough intensity of light in an office, so you may want to invest in a grow light for it. For immediate care, now that the flowers have faded, you can cut the stem at the base, and next year, around the same time, it will again bloom, just as prolifically. Meanwhile, you can enjoy the beautiful shape of the rosette, and it's pretty color. 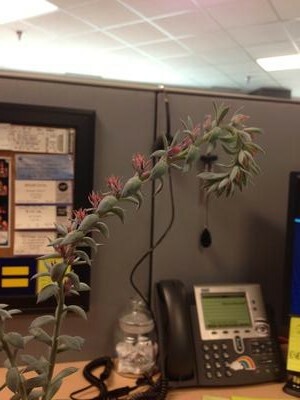 I have the same plant now for over a year. Though I lived in NC for 28 years, I am now in northern England (near the Scottish border). Last year we kept it outdoors during the summer (lots of rain) and it thrived. We brought it in the conservatory over winter (lots of light) though temperatures get quite chilly (near freezing at times but no wind). This summer we have kept it indoors. We cut some of the flower stems; new one came back and the ones not cut came back with new flowers and leaf petals. Cut flower stems can be re-rooted as well as the leaves.